Floridians are fortunate to be able to grow fruits and vegetables year round. Luckily for us, our visit here overlaps the strawberry harvest, and so Scot asked for strawberry shortcake. My couple of complaints were that I dislike the store-bought cakes that generally come with the program, and I did not feel like creating anything new. So I used homemade crêpes instead, because I keep them in steady supply in the freezer and they are lighter than regular cakes. Many of my versions of crêpes are slightly tangy, because I make them from extra unfed sourdough starter, or I just make more traditional versions. I also have a buckwheat griddle cake starter in the refrigerator that might make a nice alternative. However they manifest themselves in my food lineup, crêpes are always helpful to have around and are delicious. And so were my strawberry short“crêpes.” I enjoy making strawberry shortcake with herbs, such as mint or basil, and I utilize honey instead of sugar. I warm the strawberries with a little juice (such as cranberry or orange, fresh or store-bought) in a sautée pan. Finally, for texture, I use a lightly salted nut, such as whole pistachios or even chopped walnuts, which I generally also keep handy. 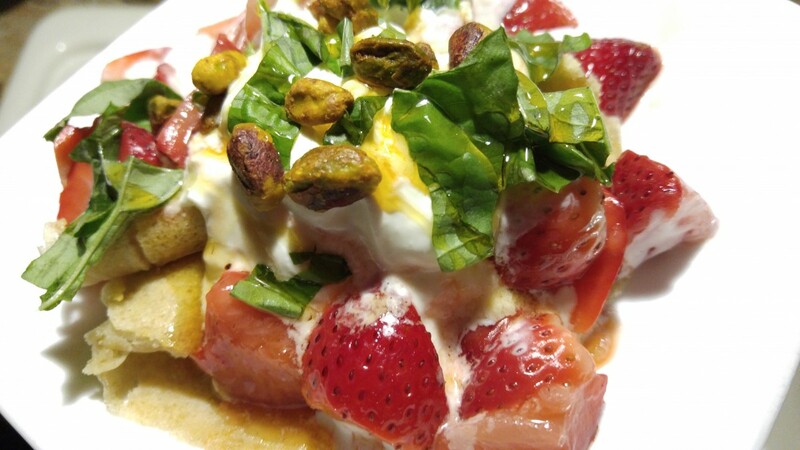 This is a full gluten, lactose and fat recipe with local honey and strawberries, and it is yummy. Hope you enjoy. With a whisk or frother (a handy kitchen tool that I use for cappuccino or café con leche or small blending tasks) , whip the heavy whipping cream into a stiff pillow. Add a little honey to it before or during mixing. It adds a delicate sweetness and depth of flavor to the dessert. Set aside. In a small skillet, warm the crêpes, then place them on a small plate, folding them into quarters, resting one atop the other. With the skillet still going, melt the butter and drizzle it onto the crêpes. Wipe the skillet clean and return to the burner. Continuing with the warm skillet, add the quartered strawberries and sautée the strawberries for about a minute. Add the juice and stir to combine, cooking for another one to two minutes, or until the liquid thickens a little. Turn off and let the strawberries cool. Chop or tear the herbs. Place a large spoonful of the whipped cream onto the crêpes. Next, use a slotted spoon to lift the strawberries onto the dessert, then add another small spoonful of whipped cream. Shower with herbs, drizzle with honey and sprinkle with pistachios. That's it! Time to eat!